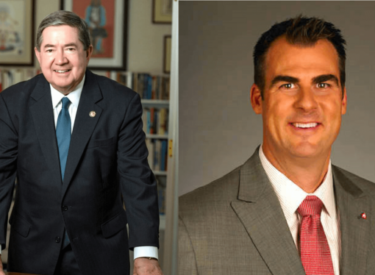 OKLAHOMA CITY (AP) – The latest campaign finance reports show mortgage company owner Kevin Stitt has raised more than twice as much as his Democratic opponent in the Oklahoma governor’s race, aided in part by nearly $5 million in personal loans to his campaign. Stitt’s report shows he’s raised $10.2 million so far in his race against former state Attorney General Drew Edmondson, who reported raising about $4 million. Stitt is the owner of Gateway Mortgage Group and a political outsider who has said he would match contributions to his campaign with his own money. His report shows he’s loaned himself nearly $4.8 million so far, including $1.5 million in the most recent reporting period. The latest Oklahoma Ethics Commission reports cover contributions and expenditures through Oct. 22.